When building and setting up a kitchen, people are recommended to invest in a blender. When people have a blender in their kitchen, they can make smoothies, protein shakes, homemade sauces, pancake mix, make salad dressing, and a lot more. In a kitchen, people should invest in machines that can be trusted. There are many blenders with different model, brands, and features that can be bought online. However, how do people decide which one to buy? This article is an in-depth review of the OXA hand blender. It is a high-powered immersion blender which has been known in the market for its performance. This article will surely convince people to replace their existing immersion blenders at home. With just one look, people will be impressed with how the entire immersion blender looks because of its sleek design. With the use of this blender, there are just so many things the user can do aside from smoothies and shakes. It can also help you make sauces, yogurt, soup, baby food, and salad dressings. This is highly recommended for those who are looking for an immersion blender with a sleek design, is a multifunctional, reliable, and affordable. This is extremely useful for those who have busy schedules who need to constantly prepare food not only for their selves, but as well as their other family members. The immersion blender has four attachments which allows and make it easier for people to chop, blend, beat, and whisk different kinds of ingredients according to what the user wanted to make. 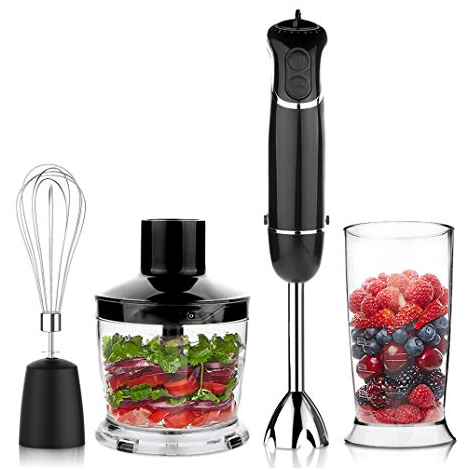 Upon delivery, included in the package are the following: a 6-speed hand blender with turbo, 500ml food processor, and rubberized handle for easier and safer grip, 600 ml beaker, and a dishwasher. The food processor has sharp blades which are very effective when it comes to chopping ingredients regardless whether it is dry or slightly frozen. There is a setting where the user can choose whether to cut or chop the ingredients into bigger pieces, or blend the ingredients. The immersion blender is known for its power which makes it highly reliable when it comes to blending, chopping, whisking, and whizzing ingredients; whether it’s a meat, vegetable or fruits. The blender’s detachable parts are washable which makes it easier for users to clean up immediately after using it. But despite the power it can produce and its other features, amazingly, the motor doesn’t produce any annoying noises. One thing people also need to consider when investing in any machine in their homes is to make sure that it is user-friendly. Thankfully, OXA Smart Immersion Blender is so easy to use. The user just has to decide what attachment to use according to what the user will prepare for the day. After selecting an attachment, they will have to attach it to the blender and choose the power setting the user thinks they will need. Lastly, the user needs to press the power button or the turbo to start blending, chopping, and whisking.